Rudi Garcia brought Moussa Sow back into the side upfront, and also selected Idrissa Gueye in the centre of midfield, in the usual fluid 4-1-2-3 shape. Antoine Kombouare chose a 4-2-3-1, with Mathieu Bodmer coming into the side in an attacking midfield role. Christophe Jallet was suspended, so Ceara made a rare start at right-back. The game was reasonably evenly-balanced, with Lille showing more attacking quality but struggling to break down PSG. The overall pattern of the game was slow and cautious. As the diagram on the left suggests, the midfield battle was comprised of three 1 v 1 battles in the midfield, as is often the case when a broad 4-2-3-1 faces a broad 4-3-3. 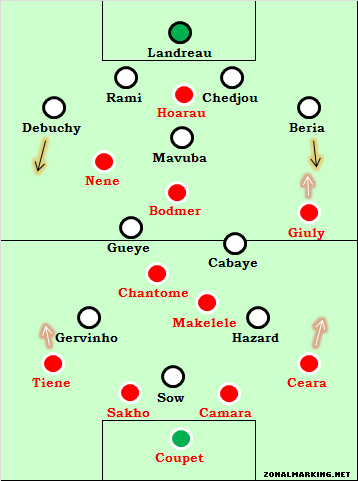 There was some level of movement within that zone – Gueye and Yohan Cabaye interchanged positions and took it in turns to join the front three, whilst PSG’s Clement Chantome played ahead of Claude Makelele – to either side, depending on where the ball was. Still, neither side really dominated this zone, and there was little creativity from the centre of the pitch. A lot of the good moments came when the full-backs got forward. With both sides playing a holding player very deep, they were generally comfortable getting their full-backs high up the pitch. Ceara had a good game at right-back, as did Siaka Tiene, but there was always a slight nervousness about leaving space at the back and becoming vulnerable to Lille’s counter-attacks. Therefore, it was Lille’s full-backs who were braver – although a couple of times this threatened to catch them out at the other end, most notably late in the second half when Guillaume Hoarau wasted a golden chance after substitute Mevlut Erdinc exploited space when Franck Beria got caught too high up the pitch. Lille wanted to play on the counter-attack. They had speed, skill and power upfront, but struggled with quick transitions from defence to attack. On the two occasions they managed to construct breaks, Gervinho dallied on the ball too long, and allowed PSG defenders to close down and block the delayed attempted pass. He was probably the main danger, however, Eden Hazard didn’t have a great game after a bright opening, whilst Moussa Sow also found it difficult to get into the game. Lille played with a clear front three, but they were not always spread across the pitch. Hazard and Gervinho were allowed something approaching free roles, and frequently came inside to form a very close-knit triangle, a little like Napoli. The interplay didn’t always come off, but there was a cohesive feel about the side – when the wide forwards came central, the full-backs got forward to provide overlaps, and pushed PSG’s wide players back. The difference between this situation and that of Napoli, of course, is that these were full-backs rather than wing-backs, and started from deeper positions. The overlapping threat was there, but it was a little slow and easy for PSG to adjust. PSG attacked predominantly down the right, particularly through Ludovic Giuly, who ran with the ball at speed. Ceara was also a threat with some long throws. On the other flank, Nene played as an inside-left rather than as a left-winger, which made them narrow on that side. He often seemed to get in the way of Bodmer, who never really had an influence on the game, despite the gap between Lille’s defence and midfield sometimes looking too large. PSG were also content to play on the counter, which meant that a large section of the game was about both sides being cautious, being reluctant to push players out of position and waiting for gaps to come in the opposition’s backline. Lille were probably more promising. Part of this was because of the distribution from deep in midfield. Rio Mavuba generally had time on the ball and could play good diagonal balls to the flanks and shorter balls out to the full-backs, whilst Makelele was pressed more quickly, and a couple of his passes were overhit straight balls. Aside from one stray pass that almost let Nene in, Mavuba had a very good game and also dropped into the back when the centre-backs moved forward. Garcia tried to change the game from the bench. He removed Gueye, brought on Tulio de Melo, and went for an attack-minded system that was more like 4-2-3-1 or even 4-2-4 – not far off the alternative system favoured by Pep Guardiola last season. 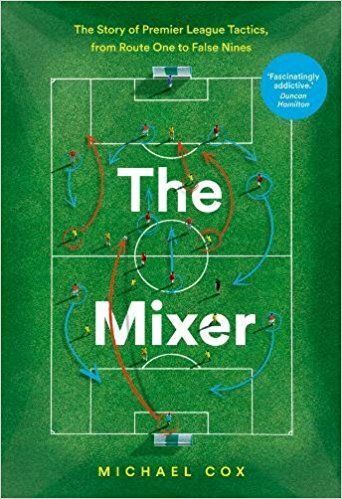 Still, the fluidity of the front four players often made them too narrow in attack, and the full-backs looked too tired to gallop up and down the line. Kombouare also brought on another forward, Erdinc, who played broadly in the same role as Bodmer, and created the chance Hoarau should have converted. The game became more stretched after the 65 minute mark, and PSG started putting real pressure on Lille, who didn’t counter as effectively as they would have hoped. It was a big call to withdraw top scorer Sow and put on Obraniak, but it turned out to be key – his left-footed whipped free-kick from the right went over everyone and into the far top corner of the net to give Lille the lead in the 89th minute. Amazingly they was more action – PSG piled forward, Gervinho countered and was brought down by Gregory Coupet, but the goalkeeper saved Mathieu Debuchy’s penalty to prevent it going to 2-0. Still, Lille held on for the victory. This was about both sides wanting to play on the counter, and therefore both being extremely reluctant to leave spaces at the back. This produced a slightly static game where not much happened for long spells – if it was a snooker match, we would have had a re-rack after the first half hour. Both sides put on extra attackers late on – this probably favoured PSG, when considering that Lille had looked the better side for the majority of the game, but the final half hour saw a spell of real PSG pressure. We might have expected Lille to take advantage on the counter, but it was Obraniak’s free-kick that made the difference. Luck? Perhaps, but since Obraniak’s done the same before, against the Ivory Coast (see below), maybe it wasn’t such a fluke. Nice pice. It wasn’t a bad game, and Hoarau should have totally buried that one. We’d be talking about how Kombouaré won it by bringing in Erdinç. Regarding the goal, I think he went for it, but it was a massive mistake by Coupet. He totally thought the ball was going over the bar. Terrible. This is a mistake as big as the ones Gomes has been doing lately, for instance. At least in my opinion. He got way too over-confident there. Coupet certainly looked casual, but could he have gotten to the ball even if he had flailed at it? It was placed just about perfectly. I wonder if he would have covered his far post if Obraniak had scored his previous free-kick for Lille in Ligue 1 rather than for Poland in a friendly, which was probably not widely covered in France. One could blame PSG’s Ivorian defender Siaka Tiéné, who came on as a substitute in the Poland match about twenty minutes after Obraniak’s goal, and was I believe the player who committed the foul which gave Lille their free-kick. Tiéné might have alerted his keeper to Obraniak’s ability from right-wing dead-balls. If he was a professional, Coupet would already be aware of Obraniak’s free kick tendancies. 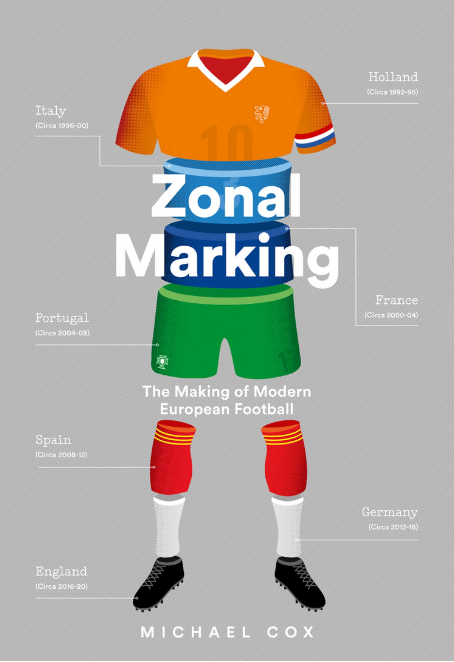 Most goalkeepers use mediapro to construct detailed profiles of their opponents for exactly the purpose of optimising their positioning and making preemptive movements. Coupet should surely have done his homework for a match as big as this. That’s very harsh on Coupet, as Obraniak has appeared in only 11 matches for Lille in all competitions this season, from a total of 46. He only came on in the 79th minute on Saturday as well. the game was not as pleasant as we could have hoped but it was still a pleasant one. I think it was because those two teams are used to dominate games against the other clubs in france and are not used to face other good attacking teams so both teams feared each other, especialy psg which where calmed down by lille’s dangerous front 3 on counters, they tried to play quick counters not very well executed in the first half instead of building their attacks using full back or axial combinaisons as they usually do. i think they also struggled because hoarau and bodmer did not combine as much as they should have, bodmer was shut down by mavuba. if lille can keep this team together, especially hazard and gervinho, for 2 years with CL experience they could be a troublemaker, a bit like lyon did against madrid last year. Indeed, the decision to cover this game is much appreciated. Regarding the upcoming transfer window, any chance of a report on players from French teams you think the EPL should be looking at? And any other leagues you have knowledge of for that matter. why’s it gotta be who *English* teams should buy? so my understanding is that Bodmer has historically been a defensive midfielder and occasionally a center back. it seems moving him forward to be in the middle of an attacking band of three with PSG began around the beginning of 2011. do you know much about the rationale of that decision or have you got any comments on its results, ZM? he played in that position at the start of his career, actually, as the #10 with Makoun and Cabaye behind him. had one especially good performance when Lille beat Man Utd 1-0 in the Champions League. when Makoun left, he moved into defensive midfield, and then at Lyon, Claude Puel (his manager at Lille too) decided to convert him into a center back. but I think everyone knew his best position was as a box-to-box or attacking midfielder, in the same sort of role that Diaby plays at Arsenal, or Toure at Man City. I guess at Lyon, he just wasn’t good enough to displace Juninho, Pjanic, Kallstrom, Gourcuff, etc. from that position. He was formed as a CB at Caen, but is in fact a natural 10 since his 2003-2007 spell at Lille under Puel. Indeed, he was a little off in this game as he was accidentally elbowed in the head by Gueye at maybe the 10th minute. Not an excuse, just an explanation. Also, Tiéné did a wonderful job to wait and destroy a counter-attack of Gervinho in the first half, he was booked on the fault giving the free-kick, so he didn’t warned Coupet about a possible direct kick. I don’t know if Coupet is to be blamed on the goal, but his behaviour jumping and not extending his arms is not helping him. Do you remember his sentence about McFadden’s goal with Scotland against France ? “Yes, I would have stopped it”. Not so sure ^^. I searched Google for flailed and I found your blog I like your blog, well done!